state is pleased to present More Water, a solo exhibition by Yarrow Lazer-Smith a.ka. Yarrow Slaps. This will be the artist’s debut solo show in his hometown of San Francisco.More Water comprises three separate but interrelated segments: two series of paintings and installation, Couples Therapy and Game of Life, and a selection of works by Yarrow’s favorite artists who he’s temporarily dubbed The Art Figaz. The title “More Water” offers a counterpoint to using fire or heat as a recognition of greatness and instead proposes that the element of water, a precious resource, should be used to denote things that are good and “of the moment”. This title points to a paradigm in the artist’s work where he both challenges and complies with different aspects of urban youth culture. The exhibition will be on view from May 5 - June 16, 2018 with an opening on May 5 from 6-8 that is free and open to the public. Yarrow Slaps was born into the San Francisco art scene. He’s the son of Darryl Smith and Laurie Lazer, the founders of the Luggage Store Gallery—the well respected multidisciplinary arts organization that has been a staple of the city for nearly 30 years. Yarrow’s unique childhood exposed him to constant visual and literal dialogue with the artist’s around him. His paintings present complex and intricate narratives about daily urban life—peering into both the mundane and sometimes surreal. The artist does not shy away from placing his characters in fantastical situations—juxtaposing homies in farm or desert scenes, as well as finding them in the intimate settings of their home quietly dining. The resulting images mix a compelling naivete with painting and a sophisticated understanding of storytelling and cultural nuance to create works that are emotional, existential and ironic. This show is about love, food, relationships and the game of life. Just like our emotions and emotional states, we can be as powerful and or vulnerable as our resources. Like water, they are something to protect. MORE WATER PLEASE! In addition to his artistic practice, Yarrow has established himself as an insightful and productive curator. Under the SWIM moniker with collaborator Auguste Somers he has curated 12 shows with approximately 100 artists and recently opened the eponymous SWIM Gallery in the Tenderloin neighborhood of San Francisco. Because his artistic practice is inextricably linked to his curatorial intent, More Water will look at both disciplines in one space. The backroom of state will present a group of artists Yarrow has dubbed The Art Figaz, an ode to Bay Area rap legend, Jacka who dubbed his crew Jacka and the Mob Figaz. This is a group of artists whose work he admires and has made an impact on his practice. The artists are: Marcela Pardo Ariza, Alex Gardner, Monica Kim Garza, Kat Geng, Erlin-Adones Geffard, Mariah GW, Justin Hager, Kezia Harrell, Sean Newport andAnthony Torrano. Yarrow Slaps is a Bay Area-based artist and curator. He recently completed a residency in Bed Stuy, New York and was an artist-in-residence at the DeYoung Museum in San Francisco. He also recently received an individual artist grant from the city of San Francisco and is co-curator of the artist collective SWIM. His work has been shown at New Image in Los Angeles, Galerie Wolfsen in Denmark and in Austin, Texas. He is currently working on an ambitious cookbook with illustrated recipes of over 100 artist’s favorite recipes. state is pleased to present Divide and Connect, a solo show of new work by Oakland-based artist Adia Millett. The exhibition will occupy all three of state’s gallery spaces with textile and photo collage works.Divide and Connect addresses a broad cross-section of themes including traditional craft and storytelling, personal psychology, attachment theory, Afrofuturism, African American quiltmaking and the artist’s ongoing investigation into the concept of ‘home’. Divide and Connect will be on view from October 14 - November 23 with an opening reception on Saturday, October 14 from 6-8 p.m. The event is free andopen to the public and the artist will be in attendance. I’m trying to weave the history of African Americans as seen in craft, with the imagination of a future where an expansive idea of the Black aesthetic exists. As discussed in many conversations around Afrofuturism, so often people of color are missing in science fiction. This work uses skewed perspective, where space is flattened out, distorted, floating, and crumbling. Here the abstracted collage, floating homes and fabric wall hangings become stand-ins for the body as well as visions of our future potential identities. Visual representations of the future are on full display in Millett’s new photo collage works. Much like her textile pieces, the collages are made from personal material including many earlier photographs from her career. The original photo becomes a representation of the past, often dismantled, broken, cut apart, andthen reattached to create something new and other. Futuristic imagery is overt in these works with imaginative structures that often look like palaces or temples with a deep warm color palette creating an otherworldly continuity that proposes a singular sense of place for the black identity to flourish. Adia Millett originally from Los Angeles, California received her MFA from the California Institute of the Arts and currently lives and works in Oakland, California. In 2001, she moved to New York City for the prestigious Whitney Museum Independent Study Program, followed by the Studio Museum in Harlem residency program. Millett has been a standout in numerous group exhibitions including Greater New York at PS1 in Long Island City, New York and Freestyle at the Studio Museum in Harlem, New York. She’s been included in exhibitions at the Barbican Gallery in London; The California African American Museum, Los Angeles; The Craft and Folk Museum in LA; The New Museum of Contemporary Art, New York; The Museum of Contemporary Art, Atlanta; The Santa Monica Museum of Art; and The Contemporary Art Center, New Orleans. In 2008, she had a major solo exhibition at the Contemporary Art Center of Virginia. Her work has been discussed in numerous publications including the New York Timesand Artforum. “We look at the present through a rear-view mirror. state is pleased to announce Present Through a Rear-View Mirror by San Francisco-based artist Rachelle Reichert. Presented as a parallel solo exhibition in tandem with Black Crown Gallery's Backward Into the Future, this exhibition is the culmination of "Summer Home", state’s first ever residency program in which Reichert was chosen to create work on-site in the month leading up to her exhibition. Present Through a Rear-View Mirroris a collection of new works that address ideas about raw materials and their extractive economies. The artist offers a close reading of material by facilitating its decay, corrosion and metamorphosis. This careful way of looking draws both inspiration from and a contrast to technological forms of vision utilized in the exploitation of materials. Present Through a Rear-View Mirror will be on view from August 5 - September 23 with an opening reception on Saturday August 5 from 6-8 PM with the artist in attendance. Backward Into the Future at Black Crown Gallery is on view from September 8 - October 14. Precarious states of transformation - entropic processes such as crystallization and corrosion - are observed. At a time when technology seeks to accelerate and disembody human experience, these observations point to larger processes that declare a primordial tempo and physicality. The front gallery will display three large scale pieces, one of which was made at state—a ten foot by four foot piece of steel rusted over the course of the residency in a salt bath prepared by the artist in the gallery. Displayed on the floor and bent in an elegant arc, the work is a striking visual record of salt’s ability to hasten corrosion. The steel’s surface is marked with a crystallized texture that references the earth’s topography as seen from above. 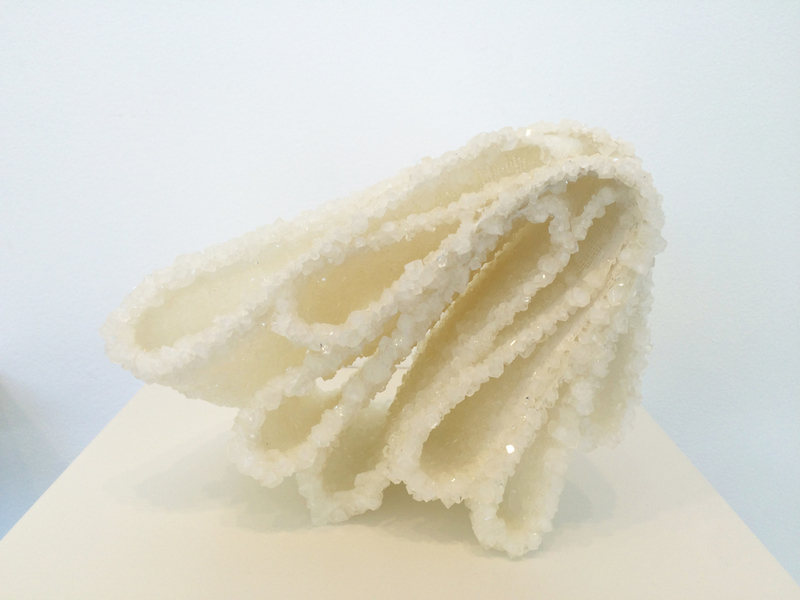 Untitled (Salt Circle), is a hanging wall piece of salt crystals bound by a circular ring of steel. Harvested by the artist off the southern shores of the San Francisco Bay, the material will slowly interact with its steel frame marking the chemical communication between salt and steel over time. The exhibition also contains a collection of recent graphite drawings on panel and paper, that are abstract references to satellite images of Chinese graphite mines as they grow. The graphite from these mines is used not only for Reichert’s drawings (which bear the names of the mining regions in their titles), but also for “clean” technology like the lithium ion batteries used to power our cell phones and electric cars. On September 14 at 6:30pm Reichert will be in conversation with satellite earth-imaging specialist and designer Robert Simmon (NASA, Planet Labs) to discuss her work and its relationship to the human extraction and consumption of earth substances that we so often take for granted. Rachelle Reichert lives and works in San Francisco. She has exhibited nationally and internationally. Select exhibitions include the German Consulate in New York City, SFMOMA Artist Gallery, Southern Exposure, and Mills College Art Museum. She was awarded residencies at Planet Labs, Can Serrat in Spain, and grants from the Susan Pilner Money for Women Artist Fund and the Russek Foundation. Her work has been reviewed and published in the San Francisco Chronicle, Make Magazine, and New American Paintings and is held in private collections such as Boston University Medical School, Red Bull Inc., and General Catalyst Ventures. This year Rachelle presented her artwork at the California Climate Change Symposium and has been granted a Research Ambassadorship from Planet Labs to create anthropogenic climate-related artwork. She earned her MFA from Mills College in Oakland, CA and a BFA from Boston University. To see her artwork visit www.rachellereichert.com. state is pleased to present Fantasy Island, a solo show by San Francisco-based artist Kelly Inouye. The exhibition features an immersive room-sized installation along with a series of large-scale and smaller figurative works inspired by the premise of Aaron Spelling and Leonard Goldberg’s popular television series. Though working on a larger scale than ever before, Inouye returns to her signature watercolor style with a palette of individually developed and mixed paints, all produced by hand over the last year. This will be the artist’s first solo exhibition in San Francisco. The opening reception for Fantasy Island will be held on Saturday, April 8 from 6-8pm. Airing weekly on ABC from 1977 to 1984, Fantasy Island, the television show, invited visitors to live out their wildest dreams on an island created specifically for that purpose. The show’s cautionary tales of excess, ego and desire - themes ripe for the Reagan era - offer an interesting parallel to our 21st century experience. Inouye's works both reflect these parallels and highlight a time when network television dominated the pop-culture landscape. In contrast to today's personalized "fantasy islands" accessed in the palms of our hands, social media’s fabricated realities, and choose-your-own-adventure style news, this exhibition draws the viewer into a contemplative space on the nature of representation, escapism and nostalgia. Inouye’s large-scale paintings, luminous at certain moments of day, abstract in the close-up, loosely realistic at a distance, populate the gallery with characters and motifs from the television show, offering kitschy wisdom, cautionary moralistic prescriptions for living, and a reminder not to forget your dreams. Kelly Inouye lives and works in San Francisco, California. Her paintings and drawings have been featured in exhibitions nationwide including Morgan Lehman Gallery in New York and Interface Gallery and Southern Exposure in the Bay Area. She has completed public art projects with the San Francisco Arts Commission and the Lower Manhattan Cultural Council and she is a graduate of the San Francisco Art Institute (MFA 2008) and the University of California at San Diego in La Jolla (BA 1998). Kelly also runs Irving Street Projects, an alternative exhibition space and studio residency program located in the Outer Sunset district of San Francisco. state is pleased to present Metafictions, Jana Rumberger’s first solo exhibition in San Francisco. Metafictions presents two separate but interrelated bodies of work: Metafictions and Data. The show is named after Rumberger’s latest body of work, Metafictions, a self-referential collection of miniature scale installations that the artist has been making since April 2016. In contrast, Data are large-scale thread based installations that visually illustrate the way data can and has been manipulated in the public realm to reach various and even conflicting conclusions. Referencing the postmodern literary device where an author acknowledges the audience directly, a “metafiction” challenges the viewer’s reality by making them part of the artist’s fictional world. Rumberger’s work is deeply tied to narrative through the creation of objects that work as artifacts of both invented and real stories. In her latest body of work, Metafictions, Rumberger has created miniature scale objects that are representations of whole bodies of her own work: some which have already been made in real life, and others that have not. By creating her work in miniature, Rumberger is allowed to have complete control over the environment the work is “exhibited” in and takes the opportunity to pair bodies of work that might otherwise have never been shown together side-by-side. Rumberger uses the diminished scale to examine how context affects understanding and response in art. Rumberger will also present two works from her Data series, which are life size installations that use thread to visualize online data. These two particular works address the wealth gap and income inequality with visualized charts about median housing prices in the Bay Area and marginal tax gaps between low income and high income earners in the United States. Both Data works will also show up as miniature variations within the Metafictions series. Jana Rumberger is an artist living in San Francisco. She received her BFA in illustration and her MFA in painting at SFAI in 2007. 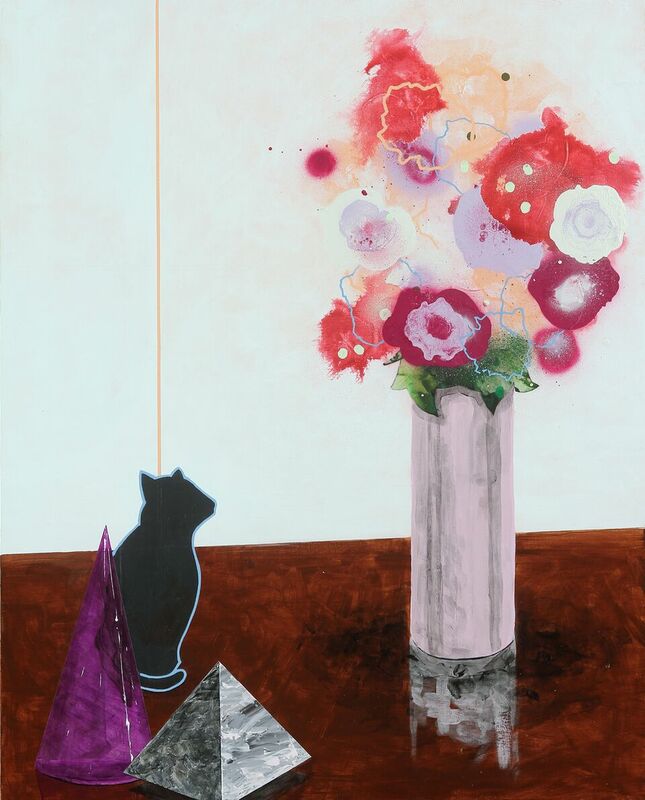 She was the recipient of the Cadogan Fellowship for painting in 2006 and has exhibited her work nationally in San Francisco, CA, Oakland, CA, Los Angeles, CA Atlanta, GA Savannah, GA, Portland, OR and New York, NY. She’s been awarded residencies at the Vermont Studio Center in Johnson, VT and Wildacres in North Carolina. state is pleased to present Strange Reprise, an exhibition of work by San Francisco Bay Area artists Maria Forde and Chris Thorson. Strange Reprise examines the artistic production of two artists who engage with the history of popular culture and its potential to shape personal and cultural identities. Forde will present her new series, Western Drawings, and Chris Thorson will be showing new work from her Tabula Rasa and Internal Monologue series. The exhibition will be on view from December 10 through January 28 with an opening reception on December 10 from 6-8pm. The reception is free and open to the public. Both artists will be in attendance. Maria Forde’s work is a recording of facts, moments and observations about the world. In a journalistic vein, the artist organizes what she sees and endeavors to find common threads in shared experiences. Her newest collection of drawings delves into the Hollywood tradition of Westerns and the way they have captured the collective imagination of multiple generations. Forde focuses mostly on American Westerns ranging from the 1930s to the 1970s, and their uncomfortable tropes: masculine and feminine binaries, Manifest Destiny and Native Americans as savages. The intrigue lies in the absurdity of capturing actors who themselves are portraying a fiction, which Forde then renders through drawings, creating yet another layer of removal. This space provides the viewer with a new opportunity to look at the construction of identity, the stories we are fed to make order out of chaos, and the way we seek to make sense of our place in the world. Chris Thorson’s latest body of work, Tabula Rasa, is a collection of cast and painted urethane sculptures that represents a cache of found sticker albums circa 1980. The works are inherently nostalgic, recalling childhood obsessions and early experiences of collecting. Under a critical gaze, the stickers of cartoon characters and pop icons shed their innocence, revealing allegiance with consumerism, narcissism, racism and patriarchy. Through the guise of children’s entertainment, toxic ideologies are sugarcoated, packaged and sent to play. Alongside Tabula Rasa, Thorson will exhibit sculptural reliefs from Internal Monologue, a series that depicts the backsides of hand held mirrors. In the pieces, the familiar mirror form omits a reflective surface, denying a physical reflection of the body, instead suggesting self-reckoning and internalization. Strange Reprise brings these bodies of work together to consider the seemingly benign seepage of popular culture into the collective consciousness, specifically the young, impressionable minds of youth. How does a mirror, a sticker book or an old movie on TV shape us? How do we grow up to recognize and untangle ourselves from the things we were once drawn to but didn’t fully understand? Maria Forde is a San Francisco-based artist. She works in drawing, painting and is well known in the Mission District for her beloved zines. She received her MFA from San Francisco Art Institute in 2003. Forde has exhibited her work locally and nationally at Needles and Pens, Pop Up Magazine, Alley Cat Books, Gallery 16, Baer Ridgeway, Little Tree Gallery and The Lab. Her work has been written about multiple times in The San Francisco Chronicle, The SF Weekly, The San Francisco Bay Guardian, 7x7 and KQED. Her work is in the permanent collections of Judd Apatow, The Capital Group and The San Francisco Arts Commission. Chris Thorson is a Bay Area-based artist. She currently works at the cross section of sculpture and painting. She received her MFA from the San Francisco Art Institute in 2004. She has exhibited her work locally and nationally in The Napa Valley Museum, Rena Bransten Gallery, Headlands Center for the Arts, Land and Sea and The Bedford Gallery. Her work has been written about in the San Francisco Chronicle, KQED, SFAQ and ArtSlant. state is pleased to present In The Same River Twice, by San Francisco-based artist Erik Parra. For his hometown, solo exhibition debut, the artist presents a new collection of drawings with a corresponding drawing installation, and new paintings with a corresponding painting installation. The work continues the artist’s line of inquiry into mid-century visual tropes and their intersection with the construction of the American Dream. Narrative unfolds through a language of pictorial construction where objects within each painted or drawn interior are chosen for their potential for symbolic form -- simultaneously loaded and banal. For instance, the artist uses unassuming tchotchkes to symbolize major public undertakings (American Exceptionalism, The Interstate Highway System and the Egyptian pyramids), prompting a dialogue about our cultural roots. state is pleased to present Across From Us a solo exhibition by Bay Area-based artist duo, t.w.five. The duo consists of Paula Perreira and Pernilla Andersson -- hailing from Brazil and Sweden respectively -- but living and working as artists locally for over a decade. t.w.five works in one material only: adhesive backed vinyl. The exhibition will feature a site-specific installation that will cover the front gallery in their signature cut vinyl, along with works from their larger-than-life Polaroid series in the back gallery. Across From Us will be on view from August 20 - September 30 with an opening reception on Saturday, August 20th. Across From Us is a presentation of ideas that t.w.five pursues in their work -- gray areas of social binaries like otherness/togetherness and social diversity/social exclusion offering perspectives inspired as foreigners living abroad. t.w.five will be creating two large landscapes rendered in both daytime light and nighttime light that explore the artists’ choice to live so far away from their families and loved ones. The contrasting light of the the two landscapes references the emotions of experiencing life in a different light -- when it’s day for you it’s night for your loved ones. The exhibition will also feature select pieces from t.w.five’s Polaroids series that addresses the concept of societal diversity by investigating notions of togetherness. The images depict situations where one is either forced or freely chooses to be in any given environment. The “polaroids” depict people brought together willingly, and also brought together through circumstance, to show the range of emotional bonds within various social structures. 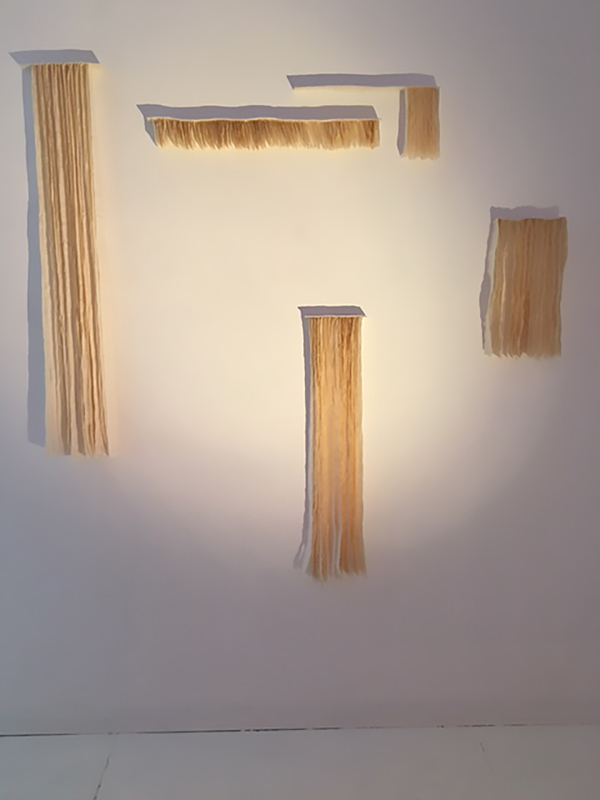 Created during their recent residency at the Headlands Center for the Arts, this will be the first time they will be exhibited outside of that setting. Formed by two artists Pernilla Andersson (Sweden) and Paula Pereira (Brazil) both artists are currently based in San Francisco and both hold Masters of Fine Art degrees from San Jose State University. They have exhibited locally and internationally at The Luggage Store Gallery, San Francisco, CA; Canāda College Art Gallery, Palo Alto, CA; and Babel Gallery, Trondheim, Norway. The two-time SECA nominees (2012/2017) have been awarded numerous residencies including Headlands Center for the Arts (Sausalito), Lademoen Kunstnerverksteder (Tronheim, Norway) and Sula Fyr (Sula, Norway). Beginning in September 2016 they will be Artists-in-Residence at the de Young, Kimball Education Gallery/Artist Studio. Their work belongs to several corporate collections including Google, Group i and GoDaddy. 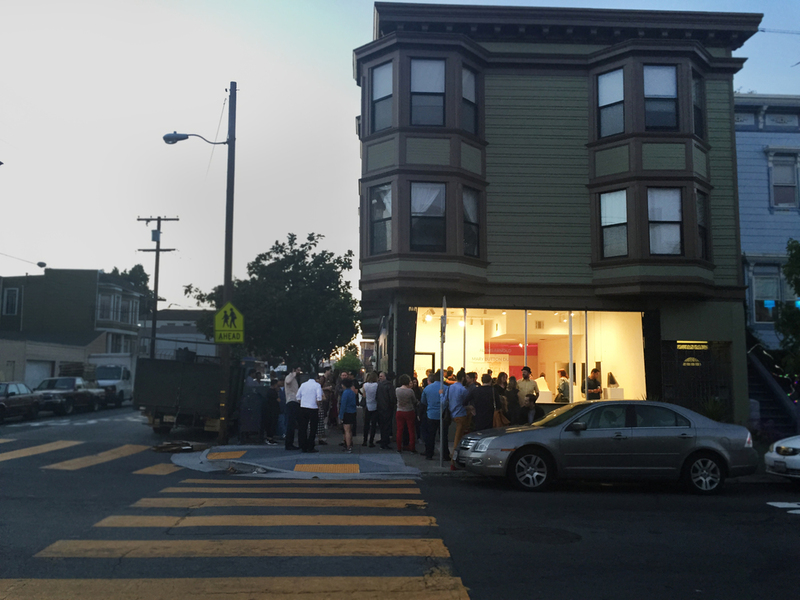 state is a new project space at 1295 Alabama Street in the Mission District of San Francisco. Danielle Smith and Kimberly Verde, the founders of FRAMEWORK, are pleased to present Material Limit, the first exhibition in a series of visual arts programing to take place at FRAMEWORK's offices, which features a gallery space designated as “state.” Material Limit will be on view from June 18th - July 30 with an opening reception on Saturday June 18th from 6-9pm. The artists will be in attendance. Material Limit brings together two Bay Area-based women sculptors Alexis Arnold and Mary Button Durell. These two artists’ practices center around the sustained investigation of material, and how that material interacts with space, light and time. 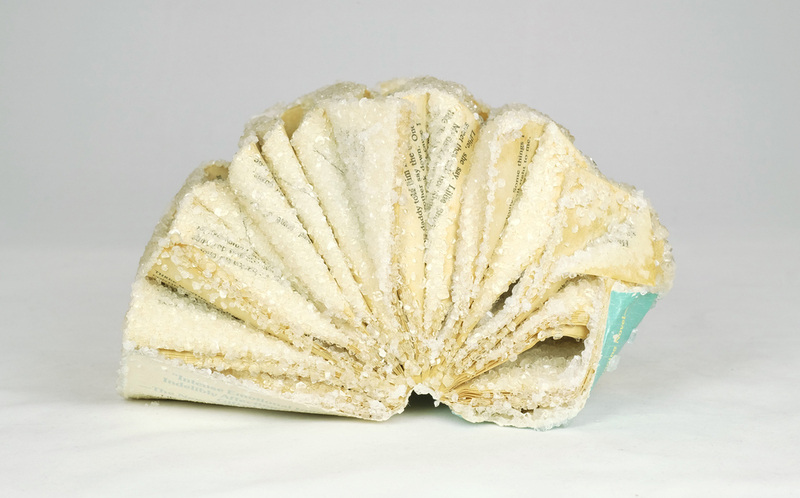 Alexis Arnold will be exhibiting pieces from her crystallized book series, a body of objects that begin as books, but are transformed into sculptures through the artist’s process for growing borax crystals onto tricky and elusive surfaces. 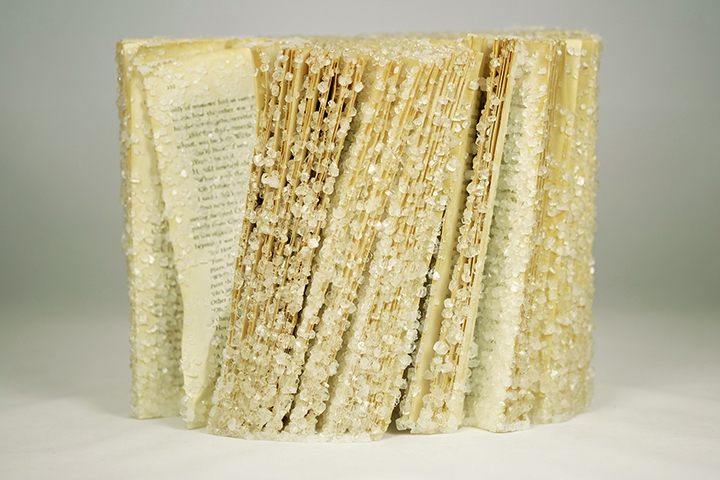 The books appear frozen and suspended in time, immobilized and inert in their ability to transmit information from writer to reader. The frozen form as well as its inaccessible content provoke nostalgia and asks questions about humanity’s millennial-long relationship to paper. Arnold will also be creating two site-specific installations that investigate the way certain materials interact with light and space over time. The larger, west-facing work will take advantage of state’s expansive windows and full sunlight, with crystals affixing to pieces of mesh screen, which will change significantly over the course of the exhibition—shifting in opacity, falling on the floor and audibly crackling as they interact with the bright conditions of the space. The smaller “sister” installation will anchor the gallery’s southern wall using the subtle nature of resin to play with perception. The piece will change as the viewer moves around it and as the day moves from morning to night. Mary Button Durell, a longtime Bay Area exhibiting artist, will be showcasing both early and brand new work. Durell works with tracing paper and wheat paste, probing the material—literally and figuratively—for over two decades. The focal point of her work in Material Limit will be The Cloud, a large, sixteen year-old, three-dimensional paper structure suspended from the ceiling. The Cloud is one form made from multiple small molds that are held together in an intricate shape by a mixture of glue and engineering acumen. For Material Limit, the cloud will be installed with attention to artificial atmospheric details like light and wind. This sculpture, like much of Durell’s work, highlights a thrilling commitment to object-making that is obsessive, meditative and endurance-based. Ambitious constructions contrast with the fragility of paper highlighting expectations about paper's capabilities as a material. Interacting with space and light to create mysterious and ethereal installations, Durell's work is anchored by an Eastern sense of the present moment, both in its creation and upon viewing.